For International Women’s Day, we recognize women in manufacturing and similar jobs. When we think of them, we tend to think of Rosie the Riveter. Rose Will Monroe is said to be the inspiration behind the character. Fun fact: the month of May is extremely significant to Rosie. 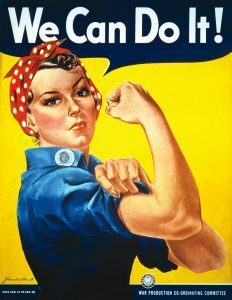 Many remember the iconic “We Can Do It!” poster. Westinghouse Electric & Manufacturing Company released it May 1942. Norman Rockwell made a painting inspired by the ad in May 1943. Rose herself passed away in May 1997. World War II was historic for women in the workplace. Women who held administrative jobs or were stay-at-home mothers filled jobs left vacant by male soldiers. When the war ended, a good amount of women remained in manufacturing. Today, now more than ever, the industry calls for more female talent. A 2015 report by Deloitte and The Manufacturing Institute states women make up 47 percent of the overall workforce. Sadly, only 27 percent of that number represents women in manufacturing. “Simply put, it can get lonely for a woman on the factory floor,” says Penny Brown of the Association for Manufacturing Technology. SFA highly recommends the Women Can Build photo exhibit, via the California Institute of Technology. We also recommend organizations are SWE (Society of Women Engineers), WiM (Women in Manufacturing), Girls Who Code, and SkillScout. No matter how you think of women in manufacturing, whether in vintage or modern tones, it is great to see that the conversation never closed up shop. Contact us for manufacturing productivity solutions that are as diverse as your employees! Call us at (877) 611-5825 or contact us on social media.